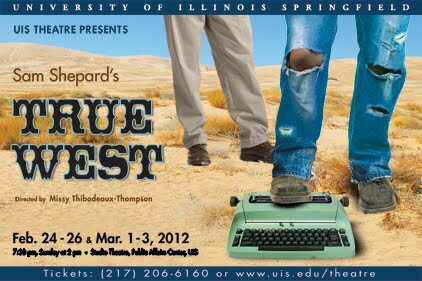 UIS Events: UIS Theatre presents Sam Shepard's "True West"
The Theatre Program at the University of Illinois Springfield will debut its second production of the 2011-12 season with the play True West by Sam Shepard, opening Friday, February 24. Six performances will be presented in the Studio Theatre, on the lower level of the Public Affairs Center at UIS - on Friday, Saturday, Sunday, February 24, 25, and 26, and Thursday, Friday, Saturday, March 1, 2, and 3. All shows will begin at 7:30 p.m. except the Sunday performance (February 26), which will begin at 2 p.m. True West explores the challenging and volatile relationship between brothers Austin and Lee. Austin is an aspiring screenwriter, Lee an unsavory drifter. Austin's attempt at creating his own screenplay to pitch to a Hollywood producer gets undermined by Lee's con-man tactics, and the two brothers find themselves in a battle of wills with high stakes. In this "Faculty Showcase" production, the role of Lee will be played by Associate Professor of Theatre Eric Thibodeaux-Thompson. In addition to Thibodeaux-Thompson, the rest of the cast includes alumnus Tom Hutchison as Saul, and community members Craig Rauch as Lee’s brother, Austin, with Susan Jeffers playing the role of Mom. UIS Assistant Professor of Theatre Missy Thibodeaux-Thompson will direct. Production/Design team members include guest scene designer Bobbie Bonebrake, adjunct faculty costume designer Kate Goodman, staff member Wes Abbott as technical director, guest fight choreographer Tony Pellegrino, and alumni Tom Irwin and Elizabeth Ingram as sound designer and props master, respectively. Student production team members include: Jason Youngberg, Gretchen Addis, Grace Rossow, Kelly Zoelzer, Colin Kautz, Heather Aymer, and Sarah Steinhour, with faculty member Pamela Salela and community members David Mees and Mary Myers rounding out the crew. For more information about this year's UIS Theatre season, contact Missy Thibodeaux-Thompson at 217/206-8307 or email mthom1@uis.edu, or visit www.uis.edu/theatre.